We all have fond memories of Groundhog Day from our youth. Every February 2, you’d glance at the TV while you were getting ready for school, briefly catching a shot of some local official holding up a groundhog. “What does that mean, again?” you’d ask your parents, eyes gleaming with wonder. “It means we’ll have six more weeks of winter … or more? I don’t know, ask your teacher,” they’d answer. Unfortunately, it looks like we won’t be able to pass that beautiful tradition on to our children. Following the New York Post’s bombshell report that Mayor de Blasio may have killed a groundhog, the Staten Island Zoo is considering ditching the part of the annual ceremony that requires the mayor to handle a frightened rodent. It was revealed yesterday that Staten Island Chuck died due to internal injuries a week after the animal either leapt from de Blasio’s hands or was inadvertently dropped (the zoo says they “don’t suspect any foul play”). The zoo, which kept the groundhog’s death quiet for months, worked to exonerate the mayor, saying Chuck received “a complete medical examination” and appeared healthy during several other events that week. “The medical evidence, the science, simply is not there,” State Assemblyman Matthew J. Titone of Staten Island told the New York Times. Zoo spokesman Brian Morris also had a convenient explanation for the cover up. “It’s kind of like telling people that Santa Claus died, but don’t worry, we’re going to have another Santa Claus,” he told the Post. 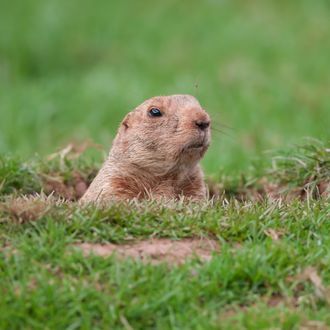 In light of the scandal, zoo officials are considering whether the groundhog “should actually be physically transferred from one handler to another or if maybe [it] should just be displayed emerging or not emerging from his enclosure,” according to Morris. That would save many innocent animals from the clutches of clumsy mayors, but it may be too late for Groundhog Day. Thanks to Mayor de Blasio, we now know that “Chuck” is just whatever member of the Staten Island Zoo’s family of groundhogs happens to be in a good mood on February 2. With that knowledge, can we really trust Chuck’s highly inaccurate weather predictions ever again? Groundhog Day was nice while it lasted. At least we’ll always have Groundhog Day.